There is a strong demand for new education and training courses in medical physics following the publication of the European Commission (EC) Guidelines on Medical Physics Expert (MPE) report No. 174  and the European Union Basic Safety Standards Directive 2013/59/EURATOM (EU BSS) , as well as the rapid development of medical techniques based on ionising radiation, growth of hospitals and the continuous need to produce competent health professionals in medical physics. Additionally, external assessment of the quality of education or training provision is needed . To satisfy this demand, the European Federation of Organisations for Medical Physics (EFOMP) has organized five successful courses over in three years attended by more than 200 people coming from all Europe under the title of the European School for the MPE. 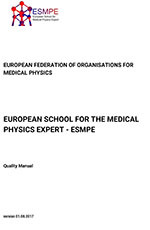 At its Marburg Council meeting held on the 11th of September 2015, EFOMP agreed to set up an organisation to facilitate further courses under the title of the EFOMP School for the Medical Physics Experts (ESMPE). The terms of reference and other related procedures are presented in the document attached, the ESMPE Quality Manual.